Shinrin-yoku is a Japanese term that translates to “forest bathing.” It refers to the practice of taking in the atmosphere of a forest to promote physical and psychological health. Forest bathing could support many types of mesothelioma treatment because it is a simple and undemanding therapy. The Japanese government has promoted Shinrin-yoku as a way of preventing and healing illness since 1982. Similar practices are established in South Korea. In these Asian countries — two of the most modern, developed nations in the world — forest therapies are even covered by some health insurance plans. So what does the forest have to offer aside from fresh air? Proponents of forest bathing point out that humans originally thrived in natural environments such as plains and forests. Humans only began living in cities and suburbs during the past few thousand years, which is a tiny fraction of our history as a species. It could be that our species evolved to depend on the natural environment to stay healthy. Researchers in Japan and Korea have spent decades studying the influence of forest air on human health, finding evidence to support the popular practice of forest bathing. The philosophy behind forest bathing has some similarities to Western naturopathy and aromatherapy. However, forest bathing also has a growing body of mainstream research behind it. 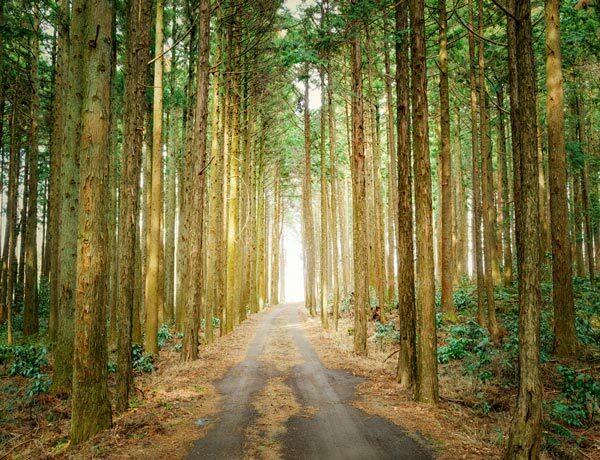 In Japan, visiting a forest is a popular way to reduce stress and maintain a healthy lifestyle. Studies have proven that relaxing in a forest lowers blood pressure and reduces the amount of stress hormones in the body. Chronic stress increases your risk of developing numerous health problems, so many holistic health philosophies give a high priority to managing stress. One example from Germany is called Kneipp therapy. It is named for Sebastian Kneipp, a Bavarian priest who lived in the 1800s and proclaimed, “Nature is the best pharmacy.” Kneipp’s long career in alternative medicine continues to inspire practitioners of naturopathic medicine around the world. Kneipp emphasized natural cures, exercising in the great outdoors and seeking a balanced lifestyle that fosters peace of mind. His American contemporary Henry David Thoreau also praised the calming and healing power of nature. In terms of complementary and alternative medicine, forest bathing fits into the broad category of “nature therapy.” This refers to any practice that relies on a natural environment to decrease stress and boost the immune system. More specifically, you could consider forest bathing as a natural aromatherapy. Aromatherapy uses essential oils to promote well-being — by either applying the oils during a massage or vaporizing the oils so they can be inhaled. The plants of a forest produce essential oils that evaporate into the air, which gives the forest its natural smell. In recent years, researchers have discovered there is more to healthy forest air than a pleasant aroma. In several studies, researchers have examined the biochemistry of people before and after a forest-bathing trip. They found forest bathing not only reduces the physical signs of stress in the body — it also increases the activity of immune-system cells that fight tumors and viral infections. In 2009, a group of Japanese scientists designed an experiment to test whether the essential oils of a forest play a role in producing these health benefits. Instead of visiting a forest in this study, research participants were sent to stay at a hotel in a city. The scientists vaporized essential oils from forest plants in the hotel rooms, recreating the atmosphere of a forest. After three nights in the hotel, the participants showed lower stress-hormone levels and improved immune-system activity. This evidence shows forest bathing is not just about relaxing on vacation. Rather, forest air is actually filled with chemicals that can benefit humans. The essential oils produced by forest trees are known as phytoncides, which means “plant-derived exterminators.” Plants use phytoncides to protect themselves from germs and insects. Phytoncides are important to a plant’s immune system. Science now suggests phytoncides can boost a human’s immune system as well. A healthy immune system can increase the effectiveness of mesothelioma treatments — especially immunotherapy. Many of the most promising new drugs being tested for mesothelioma are designed to unleash a patient’s own immune system on their cancer. But for this treatment approach to work, a patient must have a strong immune system to begin with. In 2017, a Korean study reviewed research on a few other potential benefits of breathing forest air. The study focused on terpenes, one of the main classes of phytoncide found in pine forests. Terpenes have anti-inflammatory effects that can ease lung problems such as bronchitis and chronic obstructive pulmonary disease. Terpenes may also promote brain health in old age by preventing neurodegeneration. Some terpenes even show direct anti-cancer effects in laboratory experiments. The great advantage of forest bathing for mesothelioma patients is that it is an easy, gentle therapy. Forest bathing is not about hiking up a hillside or memorizing plant names on a nature walk. There is no goal to reach, calories to burn or steps to count. The purpose of Shinrin-yoku is to slow down, take a break from your worries and breathe deep the healing essence of the natural world. Cho, K. et al. (2017). Terpenes from forests and human health. Livni, E. (2016, October 12). The Japanese practice of ‘forest bathing’ is scientifically proven to improve your health. Craig, J. & Prescott, S. (2016, January 31). Why a walk in the woods really does help your body and your soul. Song, C., Ikei, H. & Miyazaki, Y. (2016). Physiological effects of nature therapy: A review of the research in Japan. Li, Q. (2010). Effect of forest bathing trips on human immune function. Tsunetsugu, Y., Park, B. & Miyazaki, Y. (2010). Trends in research related to “Shinrin-yoku” (taking in the forest atmosphere or forest bathing) in Japan. Park, B. et al. (2010). The physiological effects of Shinrin-yoku (taking in the forest atmosphere or forest bathing): evidence from field experiments in 24 forests across Japan. Li, Q. et al. (2009). Effect of phytoncide from trees on human natural killer cell function.